As David continues to win over even more fans across the Atlantic it's good to see he has made the Entertainment Weekly 'Hotties '09 Top 25' list coming in at a not too shabby No.12! It seems his charms are universal. View David's profile on the Entertainmemt Weekly website here. Doctor Who's Greatest Moments has saluted the Doctor and his companions and now celebrates the wonderfully wicked foes that have threatened the universe and thrilled audiences for decades. The third episode, The Enemies, offers an explosive insight into the monsters and mad men whose villainy has ensured that the Doctor is never far from danger - or adventure! From human horrors like Henry van Statten and Mr Diagoras to extra-terrestrial terrors like the Daleks, Slitheen and the Racnoss, this is a rich rogues gallery of the villains we love to hate. Plenty of clips, quips and comments plus a brilliant selection of contributors who all approach the subject with relish! If you happened to miss Thursday's Doctor Who Greatest Moments: The Companions, then fear not as the BBC iPlayer have it available to view here. As our image archive is currently offline for maintenance, here are a couple of pics of David from Thursday's Doctor Who Greatest Moments to keep you going until we can get the full batch online! Doctor Who's Greatest Moments - The Companions, debuts on BBC3 at 8:00pm on Thursday, 27th August. The series is produced by the Doctor Who Confidential team and the first episode focussed on the Doctor. The second celebrates the Time Lord's travelling companions, so if you've ever wondered what it's like to swing through the stars and walk in eternity, this is the show for you! Don't forget to tune in on Thursday to spend some time in the company of Billie Piper, Freema Agyeman, Catherine Tate, John Barrowman, Elisabeth Sladen, Camille Coduri, Bernard Cribbins and the Doctor himself - David Tennant! The BBC Doctor Who site has an exclusive clip of the show here. Christian O'Connell presents the first of a new 15-part topical comedy show, which seeks to solve some of the week's big news issues. For the opening programme, Christian is joined by David Tennant and comedian Bob Mills to put right some of the world biggest (and smallest) wrongs in just one hour. They will also be offering some sage advice on David's personal problems. The Christian O'Connell Solution air on Sunday 6th September 11:00am - 12:00 noon on BBC Radio 5 Live. 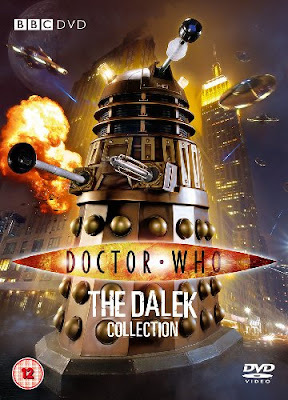 As we previoulsy reported, The Dalek Collection will be released on DVD on 19th October 2009. We now have further details of it's contents and can reveal that as well as seven action packed adventures with the Doctor and the Daleks it will include an exclusive interview with David Tennant. The episodes included in this volume are as follows: Dalek, Bad Wolf, The Parting Of The Ways, Daleks In Manhattan, Evolution Of The Daleks, The Stolen Earth and Journey's End. It can be pre ordered in our shop here. Whilst at the TCA Press Tour in the US David and Russell spoke with Richard Metzger of BoingBoing. View his brilliant 20 minute interview above. Doctor Who's Greatest Moments returns this week with a packed episode that salutes the people who share the Doctor's adventures in time and space. So stand by for more fantastic clips, new interviews and a celebration of the luckiest passengers in the universe - the Doctor's companions! The Doctor Who Confidential team, who produce Greatest Moments, have again pulled out all the stops in getting some great interviews from key contributors like Billie Piper, Freema Agyeman, Catherine Tate, John Barrowman and Elisabeth Sladen. 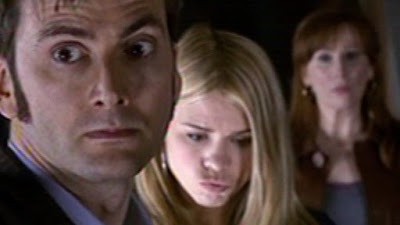 They spill the beans on many of their most memorable moments and David Tennant offers some fascinating thoughts on the whole companion/Doctor dynamic. There's the usual treasure trove of cracking clips and it's lovely to hear what the actors feel about their characters, from Billie's take on Rose before the Doctor to Freema pinpointing when Martha started to relax! 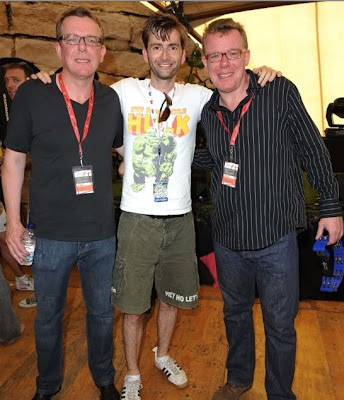 David was at V festival at Hylands Park in Chelmsford, Essex this Sunday. Whilst there he did an impromptu introduction for The Proclaimers set. The BBC today releases the first image of the animated Doctor as he will appear in the new animation, Dreamland, which is due for broadcast later this year. The six-part series will be premiered via the BBC Red Button on BBC One and the Doctor Who website (bbc.co.uk/doctorwho). The 45-minute long animation will be broadcast in its entirety on CBBC on BBC Two this Autumn and also on the BBC HD channel. 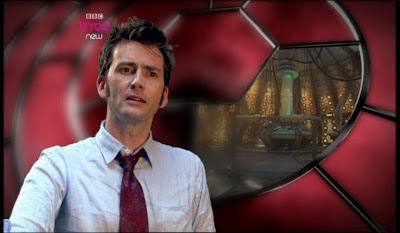 Written by Phil Ford (Doctor Who, Torchwood, Sarah Jane Adventures) Dreamland will see the Doctor – played by David Tennant – arrive at the infamous alien hot spot, Roswell. During a visit to a local diner he stumbles upon a mysterious alien artefact that leads him on a mission to rescue Rivesh Mantilax from the threat of the Viperox and the clutches of the American military. Joining David Tennant will be Georgia Moffett (Doctor Who, Spooks) in the role of Cassie Rice – the Doctor's new animated companion. If you happened to miss yesterday's Doctor Who Greatest Moments: The Doctor, then fear not as the BBC iPlayer have it available to view here. It is also repeated on BBC Three tomorrow at 02:40am and 19:00pm. As our image archive is currently offline for maintenance, here are a couple of pics of David from last night's Doctor Who Greatest Moments to keep you going until we can get the full batch online! 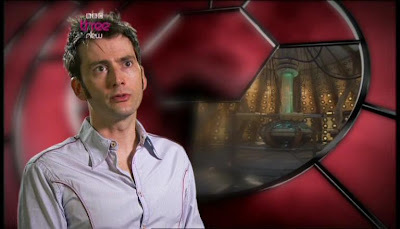 As you know David Tennant is the new host of PBS' Masterpiece Contemporary. A real-life political thriller about the negotiations that led to the end of apartheid in South Africa and the release of Nelson Mandela. Seemingly doomed to failure, the secret talks show that peace is possible. Starring William Hurt, Chiwetel Ejiofor and Jonny Lee Miller. Watch a clip of Endgame here. A 13-year-old girl vanishes from an English village, and the mystery deepens 40 years later when a journalist arrives to make a film about it. What she finds shatters the lives of all involved. Juliet Stevenson and Greg Wise star in this thriller based on the novel by best-selling author Val McDermid. As you will all know by now David's Doctor will be making a guest appearance in the new series of The Sarah Jane Adventures, which will air on BBC One and CBBC from Autumn. The title of the two part story David will be appearing in is The Wedding Of Sarah Jane Smith and it has just been confirmed that the episodes will be episodes 5 and 6 of the series. The Homecoming Scotland website have revealed the results of their recent Hot Scot poll and David fared well getting 31.6% of the vote and scooping second place. Doctor Who Greatest Moments: The Doctor will premiere on BBC Three tonight at 20:00pmYou can view a preview of tonight's episode above. The BBC Doctor Who site has a fab new blog for the new Doctor Who animated series, Dreamland. 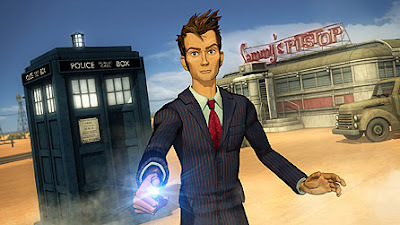 Dreamland will feature the Tenth Doctor and will be voiced by David. The lovely Georgia Moffett who you will remember as Jenny from The Doctor's Daughter will also feature as a new character called Cassie Rice. The new blog will follow the entire process of making the animation. Make sure you follow it here! Produced by the Doctor Who Confidential team, Doctor Who's Greatest Moments is a celebration of the show and a look at what makes it so enduring. As you'd expect from the title it's choc full of fantastic clips, snappily edited to make you keep saying 'That was a good bit' for about sixty minutes. If it's from the past four years of Doctor Who and you're wondering, Does it include that great moment when..? then, yes. Yes, it does. We Are Astronomers is now playing in Ireland at the Armagh Planetarium. Be sure to get yourself over there to check it out this summer. 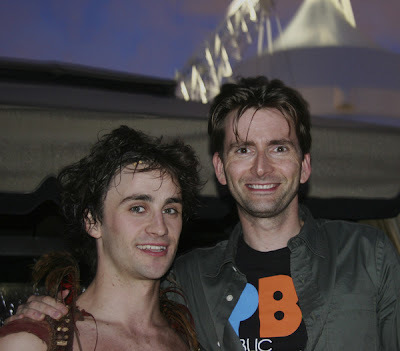 David was a recent visitor to Kensington Gardens to see the spectacular new stage production of J. M. Barrie's classic story, Peter Pan. Find out more details about how to get tickets here. Filming on St Trinian's II: The Legend Of Fritton's Gold is now in it's last couple of weeks and David's been filming some scenes on location in London recently. The photos above and below come courtesy of The News Of The World who reported on filming in the Thames! 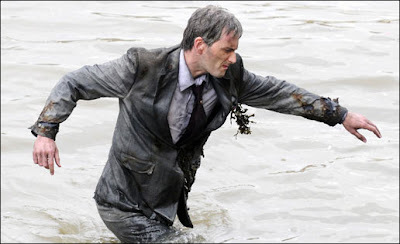 They say: David, 38, dragged himself out of the river's murky water during a scene where his villainous character, Lord Pomfrey, sinks in his boat. He then had a tussle on the shore with co-star Christian Brassington, 26. 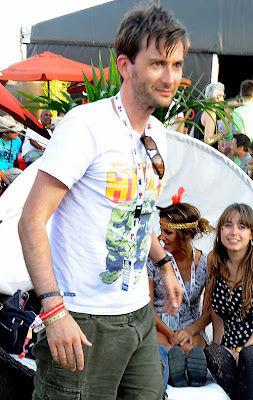 An onlooker said: "David was in his element. It must have been freezing but he didn't seem to mind." Evil Lord Pomfrey tries to stop the St Trinian's schoolgirls from finding a stash of gold. The movie, which also stars Girls Aloud's Sarah Harding, 27, and Rupert Everett, 50, as headmistress Miss Fritton, is due for release on 18 December. The RSAMD have released the two above videos of their chat with David Tennant.You can view more videos from RSAMD here. The above article to advertise Doctor Who Greatest Moments is in this week's edition of Total TV Guide (15-21 August 2009). There are some spoilers in the article.